See the picture I’m holding in this photo? That’s what I do. And I love it! I began my journey with Make-A-Wish in 2010. Initially I traveled to the office in Syracuse (home to Make-A-Wish Central New York) to volunteer as an office helper. My idea was to find out what these folks were all about and if they were truly sincere about their mission. What is their mission you ask? Are they sincere? You betcha! Although there are about 250 volunteers who gladly give their time, there are also nine unbelievably dedicated staff members who don’t know how to tell time, don’t know how to say “I can’t,” and will do anything to make a wish come true for our kids. They rock! And now five years later, with more than 40 wishes under my belt, I continue to be amazed by the kids we serve. 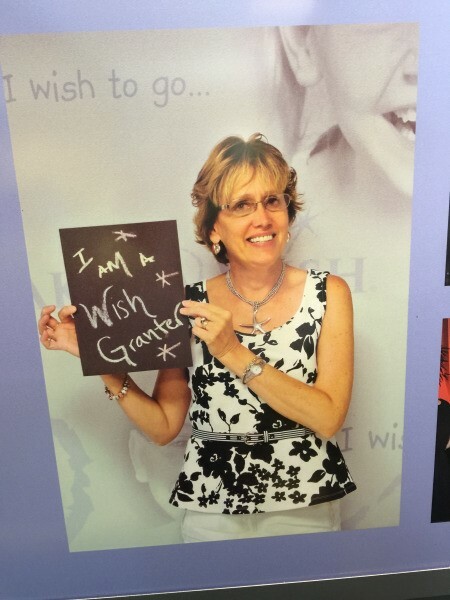 In the words of the musician Gary Allan, “Life Ain’t Always Beautiful But it’s a Beautiful Ride.” Truer words were never said from a Wish Granter’s perspective. We can’t change the hands these kids were dealt, but we can make magic with what we have been dealt and magic is what we do. And so many creative wishes from these tenacious kids. From exploring Australia to meeting famous folks like Travis Pastrana and Dora the Explorer. So why do “I Sprinkle Happy“? Not too long ago I stopped in a friends shop, A & P Master Images (masteryourimage.com). I was probably telling them a story about one of my wishes when Amanda (co-owner with her husband Howard) said, “I want your job, you go around and sprinkle happy all day.” A light went off in my tiny little brain and I told her I thought she had come up with something great. After some investigation, it was discovered that no one had tagged that line or used it as a domain name.